The Transport layer is responsible for end-to-end data communication and acts as an interface for network applications to access the network. This layer also takes care of error checking, flow control, and verification in the TCP/IP protocol suite. The Application Layer handles the details of a particular application and performs 3 main tasks- formatting data, presenting data and transporting data. In this tutorial, we will explore the different types of vulnerabilities in the Application and Transport Layer. This book covers all CompTIA certification exam topics in an easy-to-understand manner along with plenty of self-assessment scenarios for better preparation. This book will not only prepare you conceptually but will also help you pass the N10-007 exam. Each of these protocols was designed to provide the function it was built to do and with a lesser focus on security. Malicious users and hackers are able to compromise both the application that utilizes these protocols and the network protocols themselves. An attacker injects malicious code into a web page/site that a potential victim trusts. A trusted site can be a favorite shopping website, social media platform, or school or university web portal. A potential victim visits the trusted site. The malicious code interacts with the victim’s web browser and executes. The web browser is usually unable to determine whether the scripts are malicious or not and therefore still executes the commands. The malicious scripts can be used obtain cookie information, tokens, session information, and so on about other websites that the browser has stored information about. Stored XSS (persistent): In this attack, the attacker injects a malicious script directly into the web application or a website. The script is stored permanently on the page, so when a potential victim visits the compromised page, the victim’s web browser will parse all the code of the web page/application fine. Afterward, the script is executed in the background without the victim’s knowledge. At this point, the script is able to retrieve session cookies, passwords, and any other sensitive information stored in the user’s web browser, and sends the loot back to the attacker in the background. Reflective XSS (non-persistent): In this attack, the attacker usually sends an email with the malicious link to the victim. When the victim clicks the link, it is opened in the victim’s web browser (reflected), and at this point, the malicious script is invoked and begins to retrieve the loot (passwords, credit card numbers, and so on) stored in the victim’s web browser. SQLi attacks focus on parsing SQL commands into an SQL database that does not validate the user input. The attacker attempts to gain unauthorized access to a database either by creating or retrieving information stored in the database application. Nowadays, attackers are not only interested in gaining access, but also in retrieving (stealing) information and selling it to others for financial gain. LDAP is designed to query and update directory services, such as a database like Microsoft Active Directory. LDAP uses both TCP and UDP port 389 and LDAP uses port 636. In an LDAP injection attack, the attacker exploits the vulnerabilities within a web application that constructs LDAP messages or statements, which are based on the user input. If the receiving application does not validate or sanitize the user input, this increases the possibility of manipulating LDAP messages. This attack is a bit similar to the previously mentioned XSS attack. In a CSRF attack, the victim machine/browser is forced to execute malicious actions against a website with which the victim has been authenticated (a website that trusts the actions of the user). The attack would cause Bob’s machine/web browser to invoke malicious actions on the trusted website; the website would see all the requests are originating from Bob. The return traffic such as the loot (passwords, credit card details, user account, and so on) would be returned to the attacker. When a user visits a website, a cookie is stored in the user’s web browser. Cookies are used to track the user’s preferences and manage the session while the user is on the site. While the user is on the website, a session ID is also set within the cookie, and this information may be persistent, which allows a user to close the web browser and then later revisit the same website and automatically log in. However, the web developer can set how long the information is persistent for, whether it expires after an hour or a week, depending on the developer’s preference. 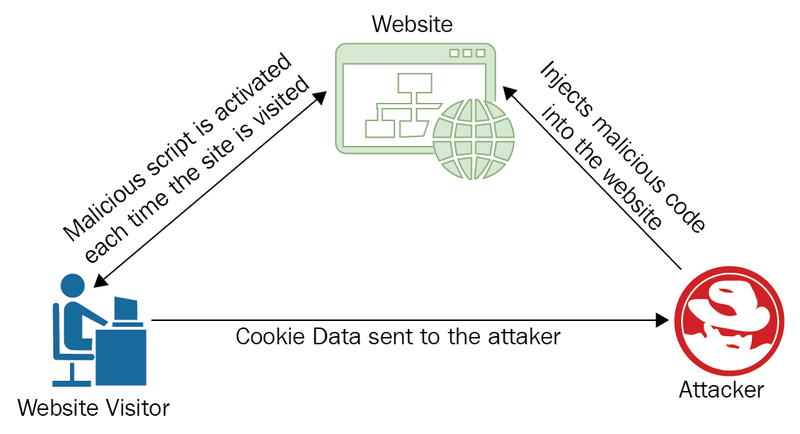 In a session hijacking attack, the attacker can attempt to obtain the session ID while it is being exchanged between the potential victim and the website. The attacker can then use this session ID of the victim on the website, and this would allow the attacker to gain access to the victim’s session, further allowing access to the victim’s user account and so on. A cookie stores information about a user’s preferences while he/she is visiting a website. Cookie poisoning is when an attacker has modified a victim’s cookie, which will then be used to gain confidential information about the victim such as his/her identity. A DDoS attack can occur against a DNS server. Attacker sometimes target Internet Service Providers (ISPs) networks, public and private Domain Name System (DNS) servers, and so on to prevent other legitimate users from accessing the service. If a DNS server is unable to handle the amount of requests coming into the server, its performance will eventually begin to degrade gradually, until it either stops responding or crashes. This would result in a Denial-of-Service (DoS) attack. Whenever a person wants to purchase a domain, the person has to complete the registration process at a domain registrar. Attackers do try to compromise users accounts on various domain registrar websites in the hope of taking control of the victim’s domain names. With a domain name, multiple DNS records can be created or modified to direct incoming requests to a specific device. If a hacker modifies the A record on a domain to redirect all traffic to a compromised or malicious server, anyone who visits the compromised domain will be redirected to the malicious website. Whenever a user visits a website, there’s the process of resolving a host name to an IP address which occurs in the background. The resolved data is stored within the local system in a cache area. The attacker can compromise this temporary storage area and manipulate any further resolution done by the local system. McAfee outlined typosquatting, also known as URL hijacking, as a type of cyber-attack that allows an attacker to create a domain name very close to a company’s legitimate domain name in the hope of tricking victims into visiting the fake website to either steal their personal information or distribute a malicious payload to the victim’s system. Let’s take a look at a simple example of this type of attack. In this scenario, we have a user, Bob, who frequently uses the Google search engine to find his way around the internet. Since Bob uses the www.google.com website often, he sets it as his homepage on the web browser so each time he opens the application or clicks the Home icon, www.google.com is loaded onto the screen. One day Bob decides to use another computer, and the first thing he does is set his favorite search engine URL as his home page. However, he typed www.gooogle.com and didn’t realize it. Whenever Bob visits this website, it looks like the real website. Since the domain was able to be resolved to a website, this is an example of how typosquatting works. It’s always recommended to use a trusted search engine to find a URL for the website you want to visit. Trusted internet search engine companies focus on blacklisting malicious and fake URLs in their search results to help protect internet users such as yourself. In this section, we are going to discuss various weaknesses that exist within the underlying protocols of the Transport Layer. In the cybersecurity world, fingerprinting is used to discover open ports and services that are running open on the target system. From a hacker’s point of view, fingerprinting is done before the exploitation phase, as the more information a hacker can obtain about a target, the hacker can then narrow its attack scope and use specific tools to increase the chances of successfully compromising the target machine. This technique is also used by system/network administrators, network security engineers, and cybersecurity professionals alike. Imagine you’re a network administrator assigned to secure a server; apart from applying system hardening techniques such as patching and configuring access controls, you would also need to check for any open ports that are not being used. DNS zone transfer allows the copying of the master file from a DNS server to another DNS server. There are times when administrators do not configure the security settings on their DNS server properly, which allows an attacker to retrieve the master file containing a list of the names and addresses of a corporate network. Not too long ago, CVE-2015-2370 was recorded on the CVE database. This vulnerability took advantage of the authentication implementation of the Remote Procedure Call (RPC) protocol in various versions of the Microsoft Windows platform, both desktop and server operating systems. A successful exploit would allow an attacker to gain local privileges on a vulnerable system. SMTP is used in mail servers, as with the POP and the Internet Message Access Protocol (IMAP). SMTP is used for sending mail, while POP and IMAP are used to retrieve mail from an email server. SMTP supports various commands, such as EXPN and VRFY. The EXPN command can be used to verify whether a particular mailbox exists on a local system, while the VRFY command can be used to validate a username on a mail server. An attacker can establish a connection between the attacker’s machine and the mail server on port 25. Once a successful connection has been established, the server will send a banner back to the attacker’s machine displaying the server name and the status of the port (open). Once this occurs, the attacker can then use the VRFY command followed by a user name to check for a valid user on the mail system using the VRFY bob syntax. During a TCP transmission of datagrams between two devices, each packet is tagged with a sequence number by the sender. This sequence number is used to reassemble the packets back into data. During the transmission of packets, each packet may take a different path to the destination. This may cause the packets to be received in an out-of-order fashion, or in the order they were sent over the wire by the sender. An attacker can attempt to guess the sequencing numbers of packets and inject malicious packets into the network destined for the target. When the target receives the packets, the receiver would assume they came from the real sender as they would contain the appropriate sequence numbers and a spoofed IP address. In this article, we have explored the different types of vulnerabilities that exist at the Application and Transport Layer of the TCP/IP protocol suite.